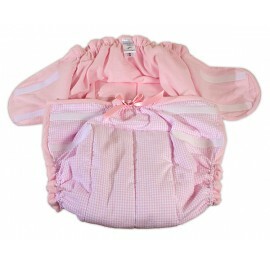 Sugary sweet adult baby diaper in soft gingham which is shaped for ease of use and is totally washable and re-usable. It comes with a waterproof lining so no need to cover them up up! Available in lots of baby colours Gingham with contrast lining and lace frill Velcro fastening for ea.. This is the latest addition to our reusable cotton diaper collection. Cute adult baby diaper in soft brushed cotton which is shaped the same as our disposable diapers but with the added bonus of being totally washable, re-usable and with a waterproof layer so you don't have to cover it up with plast..